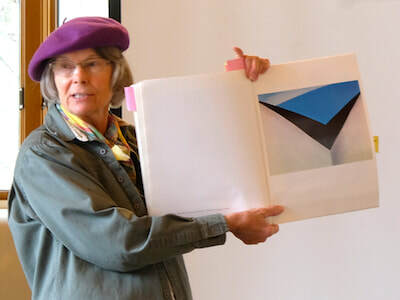 Workshop, March 14-18, 2019: "Beginners: Find Your Inner O’Keeffe and Find Yourself"
Georgia O’Keeffe was once a beginner herself. This workshop at Ghost Ranch — for beginners, amateurs, and those looking for a new start for their work — follows O’Keeffe’s dictum to "fill a space in a beautiful way." Experience lessons that transformed O’Keeffe's art and that she assigned novices. This class opens up the making of art with a view toward O’Keeffe’s own perspective and practices. I worked for O’Keeffe in 1976 and went on to study art and enjoy a long museum career. This workshop is FULL Get the schedule and materials list for this course. Sign up to get advance notices of my talks and classes. Talk, March 2: "My Time with Georgia O'Keeffe"
Join us on Saturday, March 2, 2019 at 2 pm for an illustrated talk about my time working for Georgia O'Keeffe in 1976 and what I learned about her in the years that followed. Roberta Salma is sponsoring this talk in her new studio. The address is 1375 Burlingame Ave., Burlingame, CA 94010, $10/person. Workshop, September 8-13: "Painting in O'Keeffe Country"
Treat yourself to a painting adventure in Georgia O'Keeffe's own backyard, made famous by the many landscapes she captured on canvas. Walk in her footsteps and try techniques that guided her art. I worked for her, then went on to my own career in the visual arts. Course runs Thursday afternoon, Sept. 8 to Monday morning, Sept. 13 at Ghost Ranch in New Mexico. Details will be online soon. "It was a pleasure to be in Anna’s class. I greatly enjoyed learning the basics of landscape art from a teacher who was patient, nonjudgmental, and encouraging. I also appreciate the consideration and time she took to point me in the right direction. Her help was invaluable, and I found that I could easily incorporate the lessons into my work."